I am an Olympics junkie. For a couple of weeks every four years, I live and breathe the thrill of events as diverse as swimming, diving, snowboarding and ski jumping. This year is no exception. I am on the edge of my seat in front of the television every spare minute I have. The Olympics never cease to give me a sense of warm fuzzies, patriotism and awe that a group of such incredibly diverse people and nations can co-exist for two weeks and celebrate the goodness in human nature. It would solve a lot of the world’s ills if we were able to bottle up the goodwill and save it for times when poverty, ideological and political differences create conflict. Leading this incredible organization is a former Olympic athlete – 4-time gold medalist Johann Olav Koss of Norway. The organization has expanded beyond the Olympics, but it continues to embrace Olympic ideals of sport and global citizenship as it works to improve the lives of children in some of the most impoverished areas of the world. 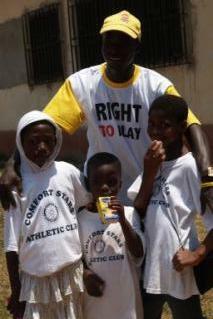 Trained Right To Play coaches have the trust and confidence of the children they coach. Based on that relationship and the innocent distraction of “play,” a soccer ball can be used to represent a virus – say HIV – and a simple game can show a child for the first time how the virus spreads. The games address other critical issues such as peaceful conflict resolution which can, in regions where children are forced into military duty sometimes as young as 11 or 12, be the difference in whether some of these children experience a childhood in any sense, or go on to a normal adulthood. The simplicity of the Right To Play model is the genius of it, and to see it first-hand is inspiring to say the least. It is hard to imagine, by American standards, how critical these simple concepts and programs are to a generation of children who bear the hope of their collective nations for a brighter future. We may look to sports as a way to obtain personal success, fitness, economic prosperity, recreation or geographic bragging rights, but to those Right to Play serves, sports can be lifesaving – the difference between dying young and going on to help their nations rise above status quo. Through these programs, individuals with a passion for sport are helping create a healthier, safer world for children – translating the Olympic spirit into everyday action items. The Olympics certainly are an inspiring time – when the world feels good and right, and it comes together to celebrate the accomplishments of young adults who have dreamed of this fleeting moment all of their lives. It is hard not to sit back in the easy chair and bask in the warm glow of the Olympic spirit. I challenge during the remaining days of Olympic competition to individually bottle that “warm fuzzy” feeling and put it to good use. We may not be able to capture it to use as a global panacea, but if each of us paid a little bit forward, we could make an enormous collective impact on the world. As you cheer for your favorite curling team, hold your collective breath as Lindsay Vonn hits the slopes or gasp at each gravity-defying snowboard trick, remember that feeling of goodwill and resolve to share it with others. Spend a little extra time teaching a child something new. Give a little more to your favorite charity. Be a little more generous with your time. Take a few minutes to chat with your neighbor – the one who might be just a little different than you. Revel in the diversity of the human race. Celebrate goodness and hard work in your community. Harness the Olympic spirit to make the life of one other person a little better.